According to PennDOT, an average of 29 alcohol-related crashes occurred daily in 2014. Nearly three-fourths of those crashes resulted in injury or death. While the number of DUI accidents has decreased in the past five years, drunk driving remains a serious problem in Pennsylvania, particularly during summer holidays. Last year during the Independence Day weekend, between July 3 and 5, there were 421 alcohol-related crashes in the Commonwealth. With this in mind, and with the July Fourth holiday approaching, here are 5 steps you should take if you are hit by a drunk driver. If you are involved in any accident, not just alcohol-related crashes, always call 911. Never accept an offer from another driver to settle the matter without involving the police. By calling the police, you are guaranteeing that you will have documentation of the crash that will be critical when filing an insurance claim or a civil law suit.If you suspect that the other driver involved in the accident was driving under the influence, watch for suspicious behavior as you are waiting for the police to arrive including slurred speech. Obtain and record as much information as you can. This includes the basics, such as the other driver’s contact and insurance information, as well as contact information for any witnesses and the names of the police officers that arrive at the scene. If possible, use your phone to take pictures or record video of the scene.Afterward, be sure to obtain a copy of the filed police report and check it for any errors. Do not refuse medical treatment even if you believe you have not been injured. 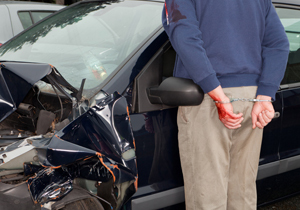 Sometimes injuries from car accidents are not immediately apparent. Similar to the police report, the medical report after an accident is an important piece of documentation that may help you later. The insurance company might try to tell you that because you have limited tort coverage, you cannot seek restitution for pain and suffering.Even though you may have limited tort which may prevent you from making a claim for your injuries, when the at-fault party was driving under the influence, you no longer have to prove you have a “serious injury” to make a claim. The Pennsylvania Vehicle Code specifically notes DUI as an exception to limited tort.Also, it is important to know the statute of limitations for injuries resulting from a car crash. You have two years from the date of the injury to either settle your case or initiate a civil claim by filing a lawsuit at the courthouse. If the other driver was operating a vehicle on behalf of a government agency, such as public transportation, the statute is still two years; however, you must put the public agency on notice within six months of the accident. If the other driver is arrested and/or convicted on a DUI, do not assume you will automatically gain restitution. Civil liability and criminal liability for a drunk driving accident are settled separately in Pennsylvania.For this reason, it is best to consult with an experienced personal injury lawyer about your case. Recovering from an accident can be overwhelming and it is not something you should go through alone. Contact an experienced KBG Injury Law attorney 24/7.